Back in February we’ve mentioned about a crowdfunding project for a new optimized Lyra2RE optimized kernel by a used called pallas on the Bitcointalk forum. Now the source code of the optimized kernel, along with the sgminer fork, has been released by pallas and we have compiled a windows binary of the miner for everyone that is interested in trying it out on Windows. Our quick test has shown about 640 KHS hashrate mining Lyra2RE with the compiled binary and the optimized kernel on a non-overclocked Radeon R9 285 GPU (with slight factory OC of the card) by increasing a bit the intensity from the default 15. The result was achieved using the AMD 15.4 Beta driver, though you might want to use the latest official 14.12 release for better performance. 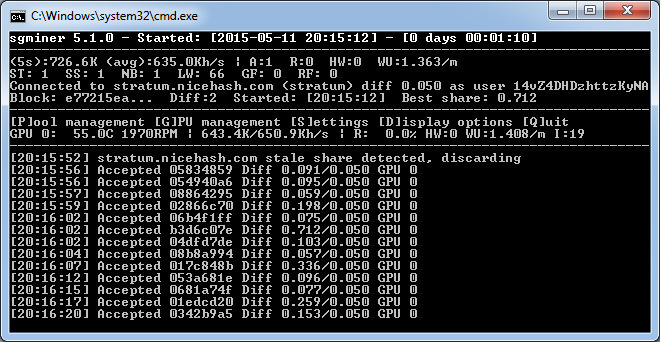 You are welcome to experiment and report what hashrate you are getting with this sgminer fork and optimized kernel on your GPU. Do note that this fork of sgminer only comes with kernels supporting Lyra2RE, therefore it is not intended for mining with other algorithms.